Right at the start of trading today, bonds took a hit from Fed comments. Although she's soon to be replaced, Janet Yellen's thoughts on the economy still matter. In her prepared remarks for today's congressional testimony (her last), she said the US and global economic expansions have been "increasingly broad-based," and that the Fed still sees inflation as transitory. Combined with overnight weakness in Europe, this was enough for bonds to start their day in their weakest shape in several weeks. The abrupt losses make for a noticeable shift in momentum according to some technical metrics. In the following chart, the rightmost candlestick is today's trading so far (including overnight). A red candlestick means yields are moving higher. 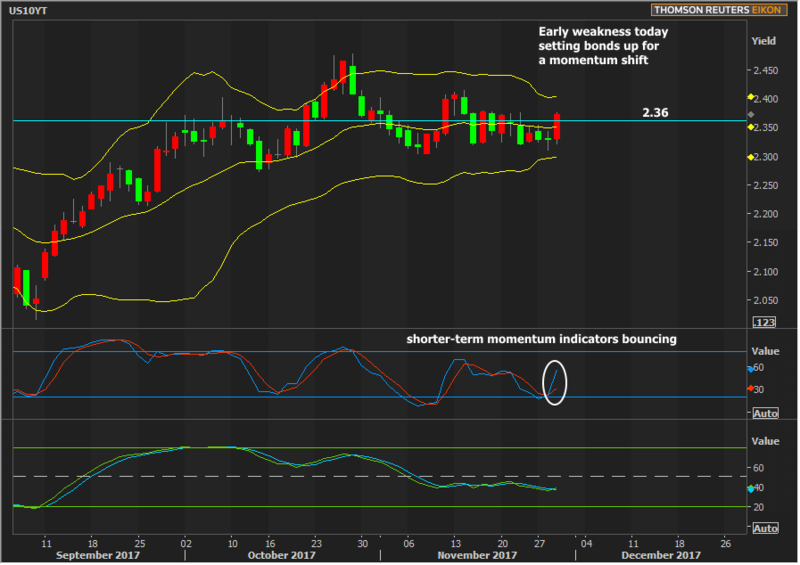 Thus, today's yields have already broken through the middle Bollinger Band (middle yellow line, also a 21-day moving average) and the 2.36% technical level. Other momentum indicators have also shifted for the worse. The caveat on the momentum math (red/blue lines) is that it's more sensitive and reactive when markets have been consolidating sideways in a narrow range. Yellen speaks at 10am, and then will be in the hot seat for congressional questions. While it might make logical sense to put less stock in Yellen's comments now that she's on the way out, consider that she may feel like she's in a position to be more candid combined with the fact that her leadership will continue to have an influence on Fed thinking long after she's gone. Traders will definitely be tuned in.